On 19th April 2014, something unusual happened to Jose Mourinho. After a run of 77 undefeated games at Stamford Bridge (61 wins and 16 draws), he finally found himself on the losing side when the final whistle blew. The shock was made all the greater by the fact that Sunderland, who were propping up the table, were the visitors on the day. Chelsea, by way of comparison, were very much in the title picture (if you can imagine such a thing). I want to congratulate again Mike Dean. I think his performance was unbelievable and I think when referees have unbelievable performances I think it’s fair that as managers we give them praise. So, fantastic performance. He came here with one objective. To make a fantastic performance. And he did that. That little sarcastic blast duly landed Mourinho with a £10,000 fine – though it wasn’t the first time he’d been guilty of lashing out at match officials, and it almost certainly won’t be the last. When Didier Drogba was sent off during Chelsea’s Champions League defeat by Barcelona, Mourinho accused Barcelona manager Frank Rijkaard of entering the dressing room of referee Anders Frisk at half-time.That got him a two-match ban and an £8,900 fine. Frisk quit the game soon after following a sustained volley of abuse and even death threats from Chelsea fans. 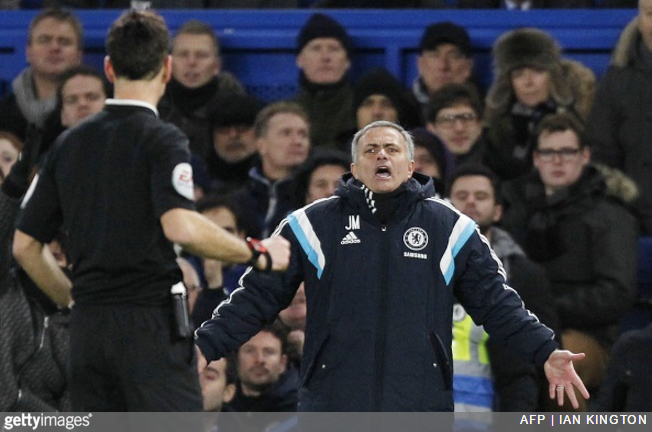 After Ramires was sent off against Aston Villa in April 2014, Mourinho went striding out onto the pitch to tear into referee Chris Foy (above), who had just dismissed his sixth Chelsea player in his last eight games.Mourinho then requested (via his press conference) that the FA stop sending Foy to referee Chelsea matches, subtly claiming the official had a red-card conspiracy against him and his team. The following season, in December, Mourinho was fined £25,000 when he just came right out and claimed there was a campaign to influence referees against Chelsea. Telling the press referees were “afraid” to give decisions Chelsea’s way then earned him a further £50,000 fine in October 2015. You’d think he’d have learned to keep his mouth shut by that point. However, it wasn’t just referees in England that attracted Mourinho’s ire. In March 2010, while managing Inter Milan, Mourinho made hand-cuff gestures to a referee in protest at the decisions being made during a match. Jose was fined £35,000 and banned from the touchline for the next three games. And in December of the same year, while managing Real Madrid, he marched into a press conference following a game against Sevilla brandishing a type-written list of 13 “serious mistakes” made by the referee. When he had time to type it up is anybody’s guess. Yes, that just about sums it up nicely.